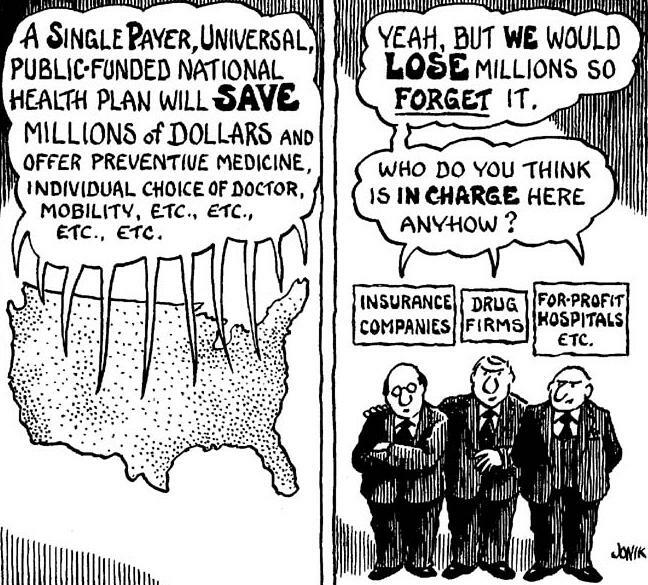 Pete Dolack estimates that about $1.4 trillion dollars are siphoned out of the US health care system each year because of its private, for-profit nature, more than enough to pay for a single-payer system. How does he arrive at this figure? He calculates the average per-capita expenditure on health care for Britain, Canada, France, and Germany for the years 2011 to 2016 and arrives at $4,392 per year. For the US the figure is more than twice that at $8,924. If you take the difference and multiply that by the US population of 317 million, the excess comes out to $1.44 trillion. Where does all this extra money go? Not for better care, certainly, considering that tens of millions of Americans have no health insurance and thus lack access to health care, unlike in the other countries where everyone is covered. The average length of hospital stay in the US is 5.5 days, shorter than the 7.6 days of the four comparison countries, so that can’t be it. It is possible that in the US if you live in an urban area and have good employer-based health insurance and/or enough wealth to not worry about out-of-pocket expenses, you might be getting more in terms of access to high-tech equipment and specialist care, since those are the money-making parts of the industry. But that can surely explain only a fraction of the increased expenditure. The answer is that most of this money goes not into providing more and better care but into the private profit-making parts of the health industry, from the parasitic insurance companies to the drug manufacturers that charge exorbitant amounts for their drugs, to the manufacturers of high tech equipment that push for their widespread use in as many facilities as possible irrespective of duplication and lack of optimal use. Dolack points to a study that found that for-profit HMOs took out 19% of revenues as overhead while the US Medicare program took out just 3% (Canadian Medicare took out just 1%.). All this would be eliminated in a single payer system. The added bonus would be that you would not have to deal with the maddening complexity of the billing system that follows whenever you get any treatment. Accidentally posted in the “Prolonging Life” thread. That any sane nation, having observed that you could provide for the supply of bread by giving bakers a pecuniary interest in baking for you, should go on to give a surgeon a pecuniary interest in cutting off your leg, is enough to make one despair of political humanity. Somebody’s got to say it--the sticking point is, of course, the first four words in Shaw’s quote. Evidence to date doesn’t support the the hypothesis that the US is a sane nation. The US health care system has so many criminals, we can easily afford to waste a few.